THE CHIEF EXECUTIVE of Permanent TSB has declined an invitation to appear before the Oireachtas Finance Committee on Tuesday to answer questions about the planned sale of home loans. The bank announced that it is to sell off a €3.7 billion portfolio of non-performing loans, including mortgages on 14,000 private dwelling homes. Last week the Finance Committee decided to invite the bank’s chief executive Jeremy Masding in to discuss the planned sale. His appearance is listed on the Oireachtas schedule for next week, at 2pm on Tuesday. However the committee received a letter from Masding yesterday evening, stating that it would not be “appropriate” for him to attend on this day. Masding told the committee that the bank would be agreeable to a meeting of the committee to discuss the issue, but it is currently in a closed period ahead of the publication of its annual results on 14 March. Though he expressed a willingness to agree another date with the committee, he said whenever PTSB does attend a meeting, it will be constrained in its ability to answer detailed questions about the planned sale, which he described as “commercially sensitive and in progress”. Speaking to TheJournal.ie, chair of the Finance Committee, John McGuinnness said the banks in Ireland “believe they can do what they want”. “We will be sending the letter to the [finance] minister to highlight what’s going on. What they are doing now is playing for time. It could be that by the time we get to them they will have already gone ahead with the sale. They know exactly what they are doing,” he said. He accused the bank of attempting to avoid transparency ahead of the sale and said this behaviour was contrary to statements made in recent months by all of the main banks promising a culture shift. This it the opposite – they keep repeating: apology, apology, apology, and at the same time they’re making up their lists of who they’re going to throw to the vulture funds. It’s outrageous. PTSB last week defended the plan, entitled Project Glas, as it said these loans were “typically owned by customers who have not engaged with the bank, whose mortgages are unsustainable or who have been unable to meet the terms of various treatments put in place”. It said some account holders have not engaged with the bank for over seven years and on average the loans are over 3.5 years in arrears. The bank also said many of these customers have made no payments at all for years. McGuinness said the purpose of the meeting on Tuesday was to get a breakdown from the bank’s officials of the various cohorts of people included in the loan book, how much they owed, how long they had been in arrears and how long they had gone without paying any money to the bank. “There are various numbers and so on out in the public domain and there are people who are customers of Permanent TSB who are not sure whether they’re in it,” he said. Yesterday morning Ulster Bank’s outgoing CEO Gerry Mallon also said that the bank could sell as many 7,000 mortgages in arrears. McGuinness said his committee will be requesting all of the pillar banks appear before it to discuss these sales. Email “PTSB chief refuses to appear before Finance Committee next week over loan sale”. 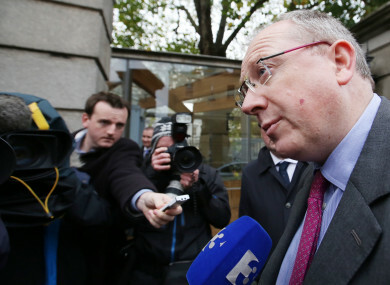 Feedback on “PTSB chief refuses to appear before Finance Committee next week over loan sale”.